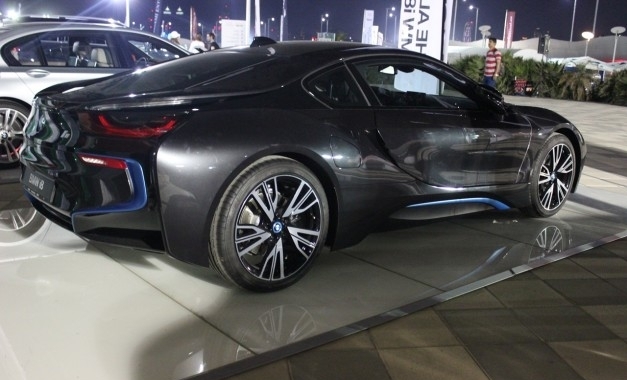 The right hand drive version of the BMW i8 hybrid sportscar has been spotted at a dealership in India, ahead of the car’s launch here in February 2015. The i8 will be the German luxury and sportscar brand’s new flagship, with a price tag in excess of 2 crore rupees on the cards for the hybrid. The i8 is a CBU import that arrives straight from Germany. The i8 is a brand builder out and out. Only a handful of cars will be sold in India. 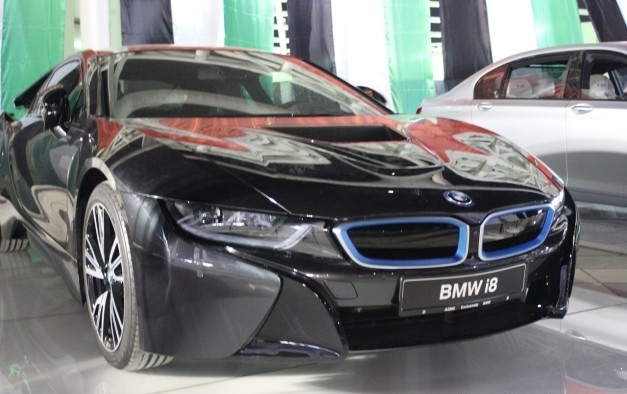 The i8 is also India’s first hybrid sportscar, and BMW’s second hybrid car after the 7-Series Hybrid. For propulsion, the i8 uses a 1.5 liter-3 cylinder twin turbo petrol engine and lithium ion batteries powered electric motor. The 1.5 liter petrol engine outputs 231 Bhp-320 Nm while the electric motor churns out 131 Bhp and 250 Nm. Combined output of the petrol and electric motors are rated at 362 Bhp and 570 Nm. While the petrol engine drives the rear wheels of the sportscar by means of a 6 speed automatic gearbox the electric motor drives the front wheels by means of a twin stage automatic gearbox. The 0-100 Kph sprint is achieved in 4.4 seconds while top speed is an electrically limited 250 Kph. 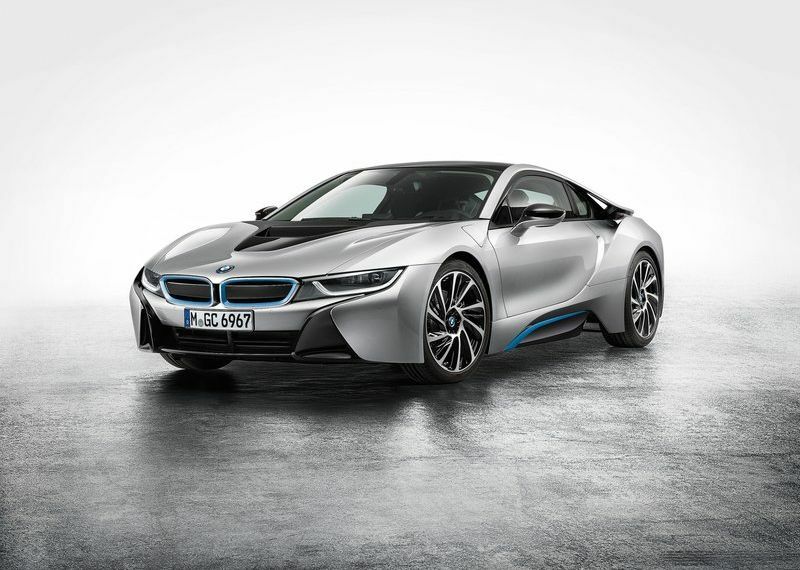 The i8 is capable of operating in all-electric and hybrid modes. In all-electric mode, the car has a range of 36 kilometers with the top speed limited to 120 Kph. This mode is particularly useful for short commutes within the city in stop-go traffic, where the combined might of petrol and electric motors is simply too excessive. 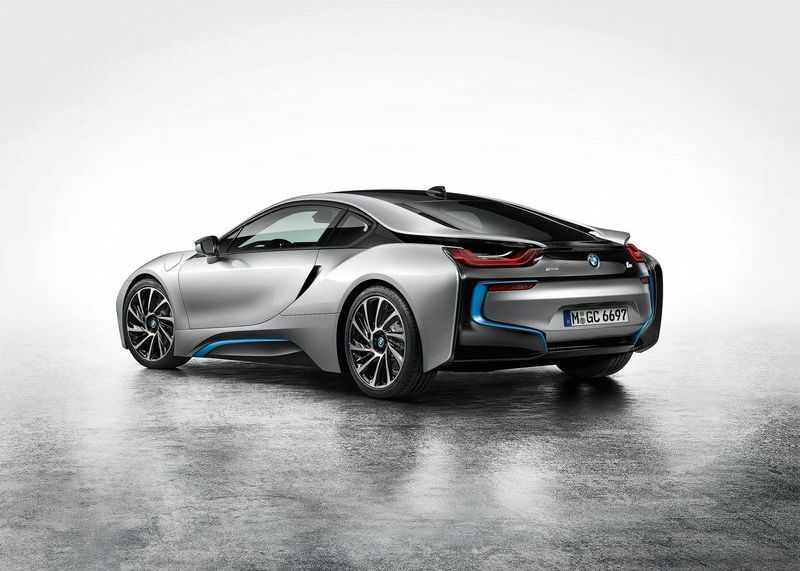 This flexible nature of the i8 allows the sportscar to deliver stunning fuel efficiency. BMW claims a mileage of up to 40 Kmpl for the i8, a figure that seems realistic given the fact that the electric motor’s batteries can be recharged on the go by means of brake energy regeneration. Also, the idle stop mechanism of the 1.5 liter engine cuts fuel consumption and tail pipe emissions during stop-go traffic conditions. The i8 uses a chassis that combines carbon fiber reinforced polymer for the passenger cell and an aluminium structure that houses the drivetrain and batteries. This combination has allowed BMW to keep weight at the minimum, what with the i8 tipping scales at a light 1,485 kilograms. The four seater hybrid sportscar comes with a drag coefficient of 0.26, making it one of the most aerodynamic cars in the world.